Competition entries may be made on Facebook here. 1. Think HQ of 16-20 Thistlethwaite Street, South Melbourne (“the Promoter”) is responsible for conducting the A Taste of Harmony Competition (“the Competition”) on behalf of the Trustee for the Scanlon Foundation (ABN 87 838 627 010 ) (“The trustee for Australian Multicultural Foundation Research Trust”). 6. Each entrant may only enter the Competition once. 7. Entry is free of charge. 9. This Competition is a game of skill only and chance plays no part in determining winners. This Competition is in no way sponsored, endorsed or administered or associated with Facebook. · Comment on this post and share your favourite recipe passed down to you by your Mother or Grandmother. 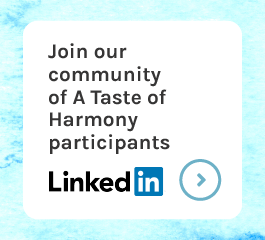 · Tag 2 mates in the comment who should hold A Taste of Harmony event at their workplace! 11. One (1) entrant will be selected as the winner by the Promoter and will be awarded with a signed copy of Maggie Beer’s latest cookbook ‘Maggie’s Recipe for Life.’ (“the Prize”). Each entry will be individually judged on the basis of originality and creativity as determined by the Promoter in its sole discretion. 12. The Promoter will announce the winner via the Taste of Harmony Facebook page on 25 January 2019 and shall send a direct message to the winning entrant with the contact details of the Promoter. The Promoter reserves the right to verify the identity of the winning entrant. The Prize shall be sent via post at an address nominated by the winning entrant. The judges’ decision is final and no further correspondence will be entered into. 13. If the entrant does not contact the Promoter within two (2) days of the Promoter sending the direct message, the Prize will be forfeited to the next entrant chosen by the Promoter in its absolute discretion. The alternate winner shall be notified via the Taste of Harmony Facebook page and shall send a direct message to the winning entrant with the contact details of the Promoter.